The day begins with warmth. Wow. I logged into Typepad this morning to find so many wonderful, heartwarming and uplifting comments regarding my last post about those fleeting moments of wishing to be in a safe place in the past. I am so grateful to those who have dropped by many times before and to those who are new visitors, for taking the time out to leave such incredibly beautiful words. It was a wonderful, warm start to what is turning out to be an exceptionally chilly day! The last few weeks have not been without their difficulties and I really just felt all cosied up in blogland whilst drinking my morning coffee with a blanket wrapped around me (this house is my favourite place to be in the world right now but boy is it cold!). I really just wanted you all to know how much your comments helped. Amongst the camera trauma's I have also been having problems loading pictures onto etsy when I am listing which has been incredibly frustrating. I have now worked out that it must be a security setting (or a firewall whatever that it!!) on my laptop which is preventing the images from loading but I now know that I can do it on the PC so that is a huge relief. So the Feeling Empty Inside Tote Bag from this post has now been listed in my accessories shop on etsy. So now I can reveal this beauty which I am so proud of and having a hard time listing as I would love to keep it for myself! But finances are tight so go in the shop it must. Please excuse the less than satisfactory photographs. It is so dark here even at midday and I have had to borrow a camera which I am not used to but as my own one may be away for a while I must plough on regardless. This bag has sides and is much roomier than the average tote. 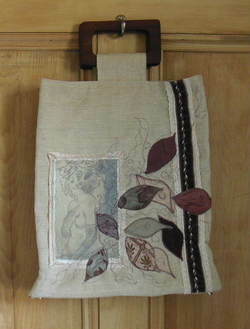 It features Dreams Like Trailing Ivy which is available as a reproduction print in my my art shop and features those appliqued hand-dyed fabric scraps, free motion embriodery and beautiful wooden handles. Even the lining has a design of leaves on it. Just gorgeous. 'Don't say you don't have enough time. You have exactly the same number of hours per day that were given to Hellen Keller, Pasteur, Michelangelo, Mother Theresa, Leonardo da Vinci, Thomas Jefferson and Albert Einstein." Well I am hoping that was the swift kick up the behind that I was needing. The course taught me that I need to use my time to much greater effect. I don't even mean just in terms of work but in all areas of my life. So there we go. A new lesson learned. I will be trying my very best to put it all into practice. Perhaps this is one of my 'small changes' - I shall let you know as I am putting the things I have learned into effect. Next week you will see a new woman!! Today this photograph is all the imagery I have for you. A photograph taken in my garden. My favourite thing in this is not the shiny ball, not even the lavender. It is the rusty old ball with that beautiful patina of age and imperfection. Just at the wrong time - when I have been so busy making things and getting ready to list things in my etsy shop my camera has decided to drive me to distraction by breaking. Now this should not be enough to frustrate me to the point that it has - but after only just getting my laptop replaced after 2 months (apparently my old one was written off as unrepairable soon after it was taken into the shop - they just neglected to inform me so I waited and waited and phoned and phoned.......blah, blah, blah) and now my camera needs to go into repair - they tell me it will be 2 weeks although I don't have much confidence in that I am afraid. I am feeling sad that such a relatively small thing should anger me so much! But in reality I am feeling sad that I feel I am so dependant on technology and also on others to realise how important my camera is to me. When going to the store yesterday I caught a scent of something on the breeze. It was the scent of autum and something else that I could not identify but as if stunned by something physical I all of a sudden I found myself thinking of a moment in my childhood. Playing in my grandparents garden with the smell of the paint my grandfather used for the garage, the smell of the greenhouse, the beauty of the carpet of sweet peas travelling up the trellis infront of the vegetable patch. And it was so painful and sweet all at the same time this memory. I sat in my car fighting back the tears, thinking of my granny who died when I was almost 11. They lived in Scotland and we were in London and I only got to see them but a few times a year. As the oldest child I would get to spend time each summer with them on my own I think. Some of the memories are so clear, others are but a mist. Picking those sweet peas for vases all around the house: playing endless games of cards with my granny; going to the local shop for 'the messages' (a scottish saying for 'the shopping') but as I was brought up in England I didn't know what that meant and thought my gran was trading secrets with all the people she met and chatted to along the way! Fish every wednesday from the fish van; the caterpillar which lived on the garage wall and which I would feed green leaves every day hoping that I would see it transform into a butterfly; the crazy carpet in the hallway; the prayer we used to say each evening when she was tucking me in to bed: the family all around at christmas, all her grandchildren in one house together; my fathers paintings dotted around the house along with the ships my great grandfather made; the daily chatter with my granny whom I adored but never had enough time with. Yesterday I would have given anything to have had just one more day with her, in that house which I loved so much. Why do I remember more about the house than I do about the conversations we would have had? I think even then I wanted to be an artist and I hope my granny knew that. I wish we had been able to have more time together, more years of visiting, chatting and laughing. No silly tantrums over broken camera's when really there are so many more important things. I hope she would have been proud of me. I hope she knows that I still think of her every day. Just popping in very quickly to let you all know that this beauty is now available as a giclee print in my art shop. I sold the original a while ago and have been dying to make a print of it and I received the proofs this morning and it is even more beautiful than I could have imagined. I have gone for a very different paper for this particular print (hence the difference in price and the fact that the printers seemed to have hiked their prices up by a mile - I do apologise - but I think it is worth it!) but really the texture of the paper is divine and gives the print the feeling of an original - the colours are perfect and I really am over the moon with it. Endlessly waiting to light the way home I think my favourite piece to date is a limited edition professionally printed giclee. This wonderful velvety paper also now enables me to title, sign and edition the print in the white border - something I could not do the with the texture of the paper I have been using for giclees to date. I have not made it to the fair today - life and a bad dose of sciatica put paid to that so all the bags I have been working on will be available in my shop at some point this week. I have had trouble deciding which shop - this one or this one as really the bags are an amalgamation of all my work - art and textiles - however I have decided they will go in my accessories shop as I feel they will be a nice contrast to my other items in there. Look out for updates this week! Tis Friday again and where has the week gone? A week of working at home for me - rather slowly I have to confess for various reasons - but I have another costume commission to begin next week along with a few small jobs for The Merry Outlaws. 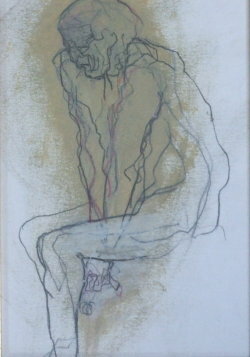 I have submitted an application for a November and December craft fair in Manchester and I have still not managed to finalise my applications and discs for the local galleries - I think it is my lack of confidence and fear of rejection that is getting in the way of that but I have to get over it and just do it!!! I have still been busy making more bags (although other things have got in the way) but here is one that just needs a bit more added and then will be sewn together. 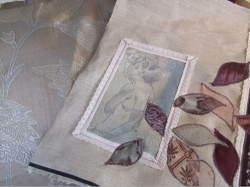 It features my piece Dreams Like Trailing Ivy and I have used those fabric scraps which I will be free machine embroidering over next. I am enjoying making these - they are enough to keep my mind occupied and my hands creating whilst not being too taxing. There are a few not so nice things going on behind the scenes at the moment and I am feeling low and as if the substance is being squeezed from my very being (I know that sounds a bit dramatic but I don't know how else to explain it and it is not something that I can or would discuss here so I apologise for my posts seeming a bit 'flat' of late). 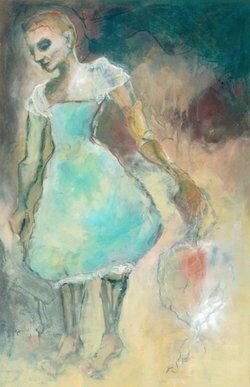 I want to paint but it just seems all a little too much - I am afraid if I start then it will all come out - which probably would be a good thing but for the moment it seem 'safer' to keep it all inside - at times I can even still pretend for a moment that none of it exists. AAaah blogging can be frustrating at times!!! I find myself wanting to use it as if I were writing to a friend - forgetting that it is open to all - I should keep my personal life distant from it but I am the sort to wear my heart on my sleeve! Anyway on a lighter note - I had bookbinding session 2 on wednesday and did indeed feel like the child who didn't do their homework. So I had to remake the book whilst everyone else went on to work on the cover - and even worse..... I had to teach a classmate who had missed out on the first session - show them how to make the inside of the book - should have been simple but gosh I felt under pressure!!! I am finding it hard enough to keep myself on track at the moment! But we got there in the end and we even had time to get the cover made too although it was a bit rushed in the end and I was not able to do it as well as I would have wanted. 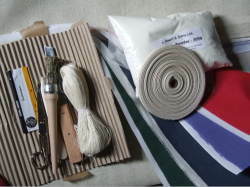 I think this class is a very traditional look at the process of bookbinding but I am certainly looking forward to experimenting and making objects in my 'own style'. 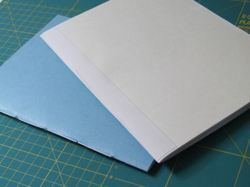 So I even ordered a starter's bookbinding set so that I can get right onto it. I don't have a board chopper or a binders press - so there will some level of adaptation just to do the basics at home but I am looking forward to the challenge. I do have a knife, cutting matte and a few rather large books to weigh things down so w e shall see how I get on with those! So I have the craft fair at the castle tomorrow and then a day with Mark and possibly a movie on Sunday. Ok back up to the loft space now for me to finish those bags! Have a wonderful weekend whatever you may be doing! Now about those small changes.......where did I put them? Well my dears, now that it is september, there is a definite nip in the air here in the shire. The fire was lit last night for the second time since we moved here. The blanket has taken up permanent residence on the couch (not that it ever really left) close at hand for a night curled up crocheting, cuddling or reading. I am trying to get into the habit of closing doors (I am afraid I was born in a barn and usually feel quite claustrophobic when too many doors are closed) and I am looking at my wardrobe trying to think of how many items I can layer to together to make an outfit. Not since days long past have knee high socks, bloomers and a petticoat been worn under a skirt. But they will be making regular appearances here you can bet. Infact I think I may put aside a day next week especially for making bloomers and adjusting more of those victorian petticoats I bought in the summer. Inbetween sketch book work I have been making a few preparations for a small fair I am sharing a table at this coming saturday at nottingham castle. As well as the usual cuffs and corsages, postcards and prints, I thought it was about time that I began work on an plan I have had for quite a long while but have never quite managed to start. That is to combine my artwork with some one of a kind accessories. All the sewing the last few weeks has quite put me in the mood for doing more and I am finding it quite refreshing as well as relaxing to not have to think too much and just stitch away making new lovely things. 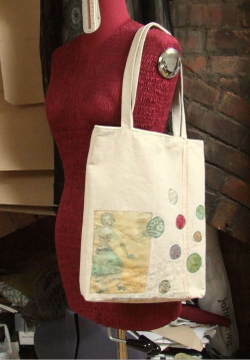 This is the first in a series of tote bags and it is not quite finished yet. 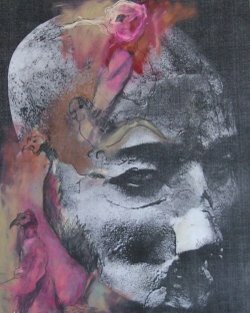 It features one of my favourite pieces Feeling Empty Inside which has been printed onto linen and appliqued. The bag is yet to be finished as I am thinking of what to put near the top - possibley a removable corsage? 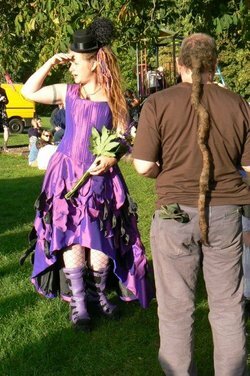 Yes I think a corsage will do rather nicely. The photograph you can see above is only a fraction of the vintage ribbon, threads, embroidery threads and fabric scraps that I have in my possession so I thought it was about time I put it all to good use. One of my favourite things to do when making costumes is to hand or machine dye fabrics. 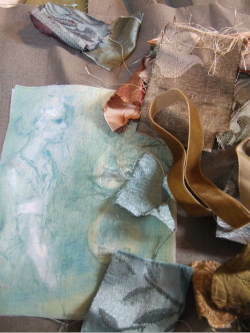 Antique, vintage and thrift store fabrics, furnishing fabrics, linens, silks - you name it I will dye it. I often do tiny little samples mixing colours just to see what will happen. My favourites are mixed fibre patterned fabrics where only part of the design will take up the most dye and you can never really tell what will happen. Well the end result of that is that I have a large bag filled with hundreds of tiny squares of dyed experiments which I have been saving for an opportunity to use them. You may be able to see if you click on the photo that I have machine embroidered the title of the image onto the bag (rather too low to be seen effectively I am afraid) but I guess this has been a bit of a prototype! 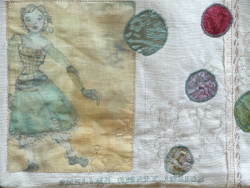 There is also my much loved free embroidery in gold metallic thread which I also love to use on my works on paper. There are a few more of these in progress which will be taken to the fair at the weekend and then if still available will be listed in my accessories shop next week. I have decided to really get my act together in the run up to christmas and apply for a few small craft fairs which will hopefully help me focus on getting lots of new work made!! Well we all know that I have been a rather poor blogger of late and I am embarassed to admit that in amongst all the busyness I had neglected to mention that a while ago I was nominated for the blogging 'Uplift Award' by the gorgeous Stephanie of Adornments and Distractions. The award was created by the equally wonderful Karen Beth of Zazazu but I am afraid amongst all her incredible and beautifully inspiring blog posts I haven't been able to find the original for the award. Debbie of Craftymoose crafts - I had to nominate Debbie for so many reasons. I have loved visiting her blog to hear of her travels to Europe over the summer and I have certainly been inspired to put together a list of many of the places I want to visit in the future based on the wonderful descriptions she gives. I am always so blessed too by her wonderful and unfailingly supportive comments on this blog and of my work. Leah of Creative Every Day. Leah's blog is a new discovery to me but I just adore her art and her recording of the process of making art and creativity and daily process. Nina of Ornamental. I can't even begin to explain what a joy it has been for me to discover Nina's blog. It is a joy to read - the writing is beautiful and meandering and poetic and every detail just makes me want to appreciate more and more the small things which go unnoticed in my every day life. Well ok - so it is my blog and I think I can claim it as my own domain so I here by declare that the Weekly Small Change shall now become (for me personally) the Monthly Small Change (oh dear that doesn't quite have the same ring to it - or possibly "The Small change I shall make in my life whenever I feel there are changes that need to be made!!!" Yes that might be a bit better if a little longwinded. Oh well - I have now run out of blog writing time as I have a lot of work to do and really should have started about 2 hours ago (eep!) 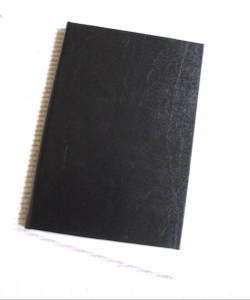 - I have my bookbinding class to attend tonight with my poor teastained half made book - do you think I should take an apple for teacher by way of apology for my careless and clumsy ways? A brand new week awaits. The end of the weekend and I am looking forward to the beginning of a new week. A new start on a new Monday - time to create, to dream, to be me, to lose myself in my work and to savour every moment of living this life and being lucky enough to call 'creating' my job. This will be the week where I be entirely focussed on my art and the things that I make. A breath of fresh air. No clock to look at, no deadline to meet. Just me, my easel, my sewing machine and my materials. Absolute bliss. I feel that I want to take more time to appreciate the small details of the things I am able to do. 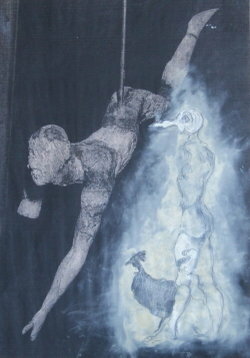 I have had so little time recently to bring to life all the ideas and images that have been growing in my imagination. So a little painting, a little sewing, alot of experimentation and sketching and we shall see what will happen! 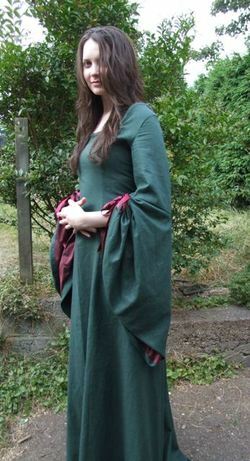 In the last week I have finished the medieval dress which was a joy to work on. I could take my time with it and trully appreciate how lucky I am to be doing the job I am presently able to do. I could take my time with the handstitching, enjoy the feel of the gorgeous linen and the silk which I used to line the sleeves. 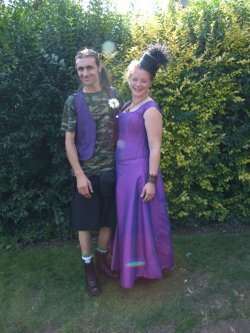 The dress is a Maid Marion costume for a girl who is part of a troupe of actors participating in various events in Nottingham - The Merry Outlaws - and hopefully I have a few jobs to do for them over the next few months - Friar Tucks costume and The Sherrif of Nottingham. 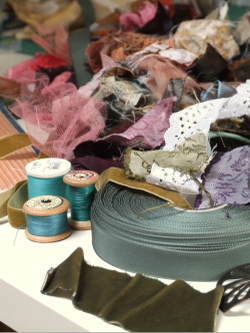 I am also hoping to work with them on some early victorian costumes for another project that is in the works. There is also another possible commission coming up - I finally feel as if things might be coming together. However finances are not and I am trying really hard to hold off on the possibility of having to take on a part time job for a while. We shall see - as long as the work remains steady and I can take the time now to work on and promote my etsy shops, get those gallery applications in and keep things steady - well my fingers are crossed let me tell you! I even managed some much needed down time this week with a trip to the cinema to see 'Atonement' which in the main was just glorious and beautiful - the costumes and production design. I had not read the book nor even read much about the synopsis of the film so I really enjoyed it. We had a lovely sunday lunch out today as well as going to a local farm produce shop for some treats for the week (ouch - we can't do that too often!). I also have a couple of new additions to my very much neglected etsy shops. 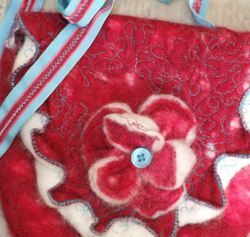 A sweet hand felted and embroidered purse in my accessories shop and a new postcard set in my art shop. I am hoping there will be a few more items to come this week! You never know - there may even be a few hand made books appearing in there soon. I know that I can never have too many notebooks dotted around different rooms in my home for when inspirations strikes and I would really love to combine this soon to be new skill with my artwork and also my textiles. Again as ever, ideas are formulating and taking shape. Can it.....can it really be the second Monday in September....already...? Now I know I seem to spend much of my blog wondering where the time goes but please tell me you are surprised by this too! The air is turning colder here. I find myself wrapping up under my cosy blanket on the sofa in the evenings, gazing at the hearth, the non existent fire. On one hand I shouldn't really need an excuse or even a reason to put some logs in and light it up as I love open fire's so very much. On the other hand I just cannot quite accept that it is reaching that time of year already. So the last week has drifted by in a sort of haze. I have been moving ever so slowly, feeling a little lost and more than a little exhausted. Unable to do all the things that I knew in my heart I should have been doing. But now we come to a new week and there are no more excuses. So onto the next task, the next commission and into the studio. But before that I do have to show you at least a couple of photos from the wedding dress commission. Not being able to attend the wedding or the evening ceremony, the bride has kindly given me permission to show these which were taken by guests. So you can now see the petal skirt! 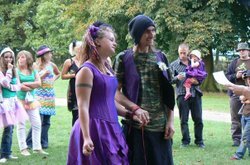 Looking at the photos I am sad that I could not make the ceremony – a very personal one outdoors with people camping and lots of love and laughter by the look of things. 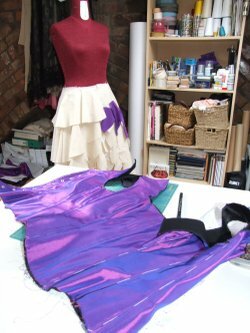 In clearing out my loft space after the destruction that had befallen it in the form of piles and piles of that gorgeous, gorgeous taffeta – I have decided to clear out a few more items from my ever present portfolios. All the pieces seen here are now available in my etsy shop. I will be sad to see them go, however go they must, to make room for more and also to help ease our finances a little if possible. I currently seem to be working ever so hard but have not yet got the hang of learning how to make a proper living out of it!! That will come in time I guess. So today is the beginning of a new commission in the form of a medieval dress. I have a meeting tonight with a troupe of actors which will hopefully lead to more commission work and then I am in the painting studio this week in-between bouts of sewing work on the commission. In truth I may be doing more sketchbook work this week as opposed to actual finished pieces. I feel I am on the cusp of something but I don’t know what. Things I want to express but I don’t know how. Although my body has been slow my mind has been racing and I now have the time hopefully to let it all out and use it to create!! I am excited but nervous. I hate to admit it but there is always that fear of failing, of forgetting how to do what I love. Hello, Hello! Oh how good it is to be back… in the real world and in the blogging world. I have felt very much cut off you see the last couple of weeks. Self-imposed, but absolutely necessary. However I have managed in my infrequent tea and coffee breaks to keep reading even if I could not comment – and to squeeze every ounce of joy out of reading what you have been up to – a wonderful distraction when it has felt as if all I could see and feel was that glorious but ultimately exhausting purple, purple taffeta. You see one of my greatest failings is my complete inability to have any concept of time whatsoever. Ten minutes turns into an hour before I know it. I get lost…don’t know where I am…all I can see is what I am doing at that precise moment. Time management escapes me. This time however I tried my utmost to plan my time ever so carefully – to have a strong idea of what I needed to do and when I needed to do it by. For the most part this was a success. Alas, however there was so much taffeta, so much sewing, which I think no matter what I had done, I still would have been rushing towards the end, at the 11th hour. I was just ever so lucky that I had one of the most relaxed brides to be you could ever meet. 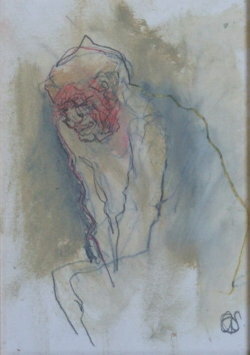 Even when I am sure she could not see an end to it, she kept the faith, as I had to do and it all got done in the end. 12 hour days of sewing all last week, 15 hour days of sewing at the weekend and a marathon 19 hours straight on Monday and it was finished. 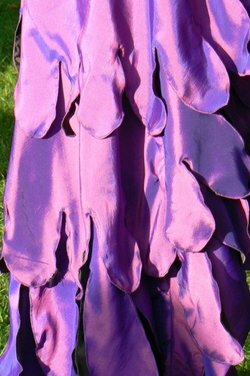 One corset, one wedding skirt for the day, one crazy petal layered fairy/flamenco style skirt for the evening (the main reason for the rush at the end – one of the most complicated things I have ever made!!! ), one bridesmaids dress, and 3 waistcoats and a toddlers dress later it is finished. I have been breathing a continuous sigh of relief ever since. There will be more photos to follow - I don't have any of the finished petal skirt yet so will hopefull have some soon. The bride and groom were wonderful and just looked so incredibley over moon on their big day. The last two days have mostly consisted of long baths, much sleep, reading under a blanket on the sofa (a luxury I usually cannot afford), plum crumble, a spot of gardening and taking my turn to make cups of tea for my poor darling Mark who has been ill all week with a chest infection and who has spent that last week making all the meals, insisting I eat them and climbing those ladders up to the loft to bring me energy drinks and more tea (without complaint). Only one of the many reasons I adore him so. I have to say that as much as I adore my loftish space - climbing up and down those ladders as much as I have had to the past 2 or 3 weeks - my body and especiall my back is now protesting so much!! One thing I have to do is get a table top ironing board as our ironing board is currently in our spare room - hence the many, may trips up and down those ladders. So what now? Well I can now finally spend some much needed and anticipated time in my art studio to get on with some work – oh it has been so long! I felt quite upset about it actually. One more day today, just to get my head together, finish cleaning the loft studio (I am too embarrassed to even take photos to show you, it is that bad), possibly get together a couple of gallery applications that I have not been able to tackle up till now, photograph a couple of things for my accessories shop, reply to emails, browse etsy, and cook for my beloved. And perhaps even a spot more reading on the sofa cuddled up under that blanket. Then I can look forward to a wonderful weekend of uninterrupted work in the painting studio where I can only hope that I have not forgotten how to get lost in my work and create and dream and apply those dreams to paper and canvas. 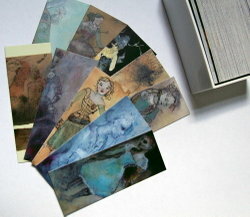 Before I go I just have to show you this little treat that I gave to myself – yes I have jumped on the moo card bandwagon but oh I do love them – so petite and tactile – I think I will group a few together to add into those gallery applications. Hello just a very brief visit to let you know that I am on a self imposed blog break till this commission is over!! The deadline is Monday and then I shall be back in to the full swing of things this week. I am missing you all and have really appreciated the comments of support and friendship and although I have been trying to keep up with some of my blog reading I haven't been able to comment. This working nonstop from home malarky is very satisfying but very intense!! So I shall be back to update you on all my news, photos and general goings on this week. I do hope you are all well and I cannot wait to have a proper catch up on what you have been up to. Again - missing you all - but I better get back to that taffeta! !